#1.2 What to Look For in a Welding Helmet? #1.4.1 What are the benefits of using the auto darkening welding helmets? #1.4.2 What welding helmet is the best for long-term health? #1.4.3 Are auto-darkening welding helmets safe? 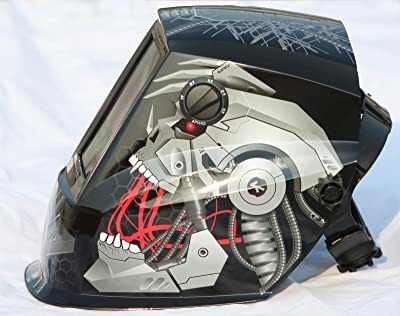 #1.4.4 How do I customize a welding helmet? #1.4.5 How does auto darkening welding helmet work? #1.4.6 What’s the difference in welding helmet filters? #1.4.7 What is grind mode on a welding helmet? #1.4.8 How do I hand paint a welding helmet? #1.4.9 Can I use a welding helmet to view an eclipse? #1.4.10 Where can I buy an auto darkening welding helmet? Whether you’re a professional welder, or you just like welding for fun, owning the best auto darkening welding helmet is a necessity. After all, a welding helmet is ultimately the only thing protecting your face from whatever you’re welding. Wearing a poorly constructed welding helmet is almost as bad as not wearing a helmet at all because your face will still be susceptible to things such as, infrared and ultraviolet light, intense heat, and sparks. If any part of your body comes into contact with these things, you could potentially suffer from eyesight problems, burning, and other serious injuries. So, instead of taking a risk, purchase a reliable welding helmet! We’re going to explore the top auto darkening welding helmets on the market, so you can decide which helmet is right for you! Once you have a good grasp of how welding helmets work, start your search to find which welding helmet is the best option for you! In order to help you with your search, I’ve compiled a list of some of the most popular welding helmets on the market. So, continue below and check them out! Superior suspension promotes a generous amount of comfort that enables long wear. Auto-darkening lenses, so you won’t have to worry about taking off your helmet to examine your work. Wider lens for maximum viewing. Includes extra lenses with a bag. Adjusting the knobs can be difficult. Head band is tighter than other standard helmets. Kicking off our list of popular welding helmets is the Lincoln 3350 Welding Helmet! Who should purchase this welding helmet? This welding helmet is perfect for welders who have at least a little bit of experience because it has the perfect mix of minimal and advanced technology. 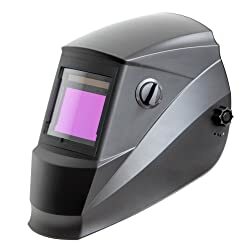 While beginner welders might find this helmet to be too advanced, welders with a little bit of experience will find the Lincoln 3350 Welding Helmet’s superior suspension technology, auto-darkening feature, and wider lenses to be extremely beneficial. What’s the best feature of this welding helmet? The superior suspension technology is argumentatively the best feature of the Lincoln 3350 Welding Helmet. With this advanced world-renowned technology, the Lincoln 3350 Welding Helmet will comfortably sit on your head and neck without causing strain or distress. In other words, you don’t have to worry about taking breaks between welding or welding for too long. Instead, you can weld at ease for as long as you want. Do I have to work inside? No! That’s another great feature of the Lincoln 3350 Welding Helmet. Since this welding helmet has auto-darkening lenses, the helmet will automatically adjust to the light in your environment. 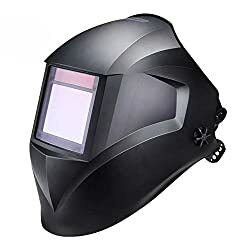 In other words, whether you’re exposed to a lot of light from your torch or from natural sunlight, this welding helmet will make sure it automatically darkens the lenses and protects your eyes. On the other hand, once your environment darkens, your lenses will automatically lighten. So, you won’t have to go through the hassle of taking off your helmet. Auto darkening lenses, which promotes an immersive and efficient optical experience. Three adjustment settings, so the helmet can fit perfectly and comfortably on your head. Grinding mode is lackluster compared to other helmets on the market. Hard to use with a hard hat. Doesn’t come with extra lenses. The next welding helmet on our list is the Jackson Safety BH3 Auto Darkening Welding Helmet! If you’ve been a welder for a long time, then you most likely know the Jackson Safety BH3 is one of the most raved about welding helmets on the market. But, is it really as good as everyone says it is? How do solar-powered welding helmets work? Solar-powered welding helmets, such as the Jackson Safety BH3, are pretty self-explanatory. Basically, a solar-powered helmet is powered by light. High-quality solar-powered welding helmets like the Jackson Safety BH3 will provide the same experience in artificial light that it does in natural sunlight. What is the lightest welding helmet? Your welding helmet’s weight plays a key factor in how efficient you work. For example, if you have a bulky welding helmet, you probably don’t like working for a long time because you experience fatigue and neck strain. But, with a lightweight helmet, you won’t even notice that you’re wearing a helmet! Luckily, the Jackson Safety BH3 is one of the lightest welding helmets on the market! Standing at 2 pounds, the Jackson Safety BH3’s plush technology promotes a comfortable and efficient welding experience. So, say goodbye to your days of headaches and muscle pains and hello to a plush experience. How does a welding helmet detect fume? A welding helmet’s outer shell plays a key role in detecting fume. This makes sense because an outer shell is the outermost later of a helmet, so it comes into contact with the environment you’re in before any other helmet element. One of the most efficient ways to detect fume is through an aerodynamic shell, which the Jackson Safety BH3 has. With this technology, the outer shell is able to detect higher levels of fumes that go above and beyond the industry standard. Auto-darkening lenses, so you don’t have to worry about taking your helmet off just to check out your work. Side windows promote clear visibility. Adjustment knobs are hard to adjust. 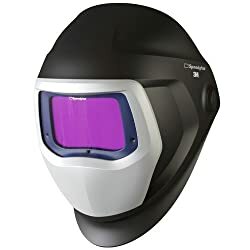 The 3M Speedglas Welding helmet 9100 with Extra-Large Size Auto-Darkening Filters is one of the best helmets on the market for new professionals. Check out why! Yes! Auto-darkening lenses are one of the most useful aspects of the 3M Speedglas 9100 Welding Helmet. Auto-darkening lenses are pretty self-explanatory in the sense that they lighten or darken depending on your surroundings. So, if you’re working outside or in extreme light, the 3M Speedglas 9100 will automatically darken its lenses to protect your eyes. But, once your torch is off and you’re in natural levels of light, your lenses will lighten. This helmet is battery powered. Is it still powerful? Although the 3M Speedglas 9100 Welding Helmet is battery powered, it uses lithium batteries that are resilient and durable.When you purchase the helmet, a few batteries are included. But, expect to purchase batteries for the remainder of the time you own the 3M Speedglas 9100 Welding Helmet. Although the 3M Speedglas 9100 Welding Helmet is not equipped with the new and improved solar-powered technology that most new welding helmets have, this helmet’s auto-darkening feature is designed to function approximately 2,000 hours until you will have to replace the batteries, which isn’t too shabby. How should I store my welding helmet? It’s important to store your welding helmet in a safe and secure place. When you’re not using your welding helmet, a specialized bag is a great place to store it! Luckily, the 3M Speedglas Welding Helmet comes with a complimentary helmet bag. So, you won’t have to worry about finding a bag that your helmet fits in. Auto-darkening lenses to make your welding experience more efficient and pleasurable. New and improved LCD technology. The natural lightweight aspect of this helmet makes it feel cheap and not as durable as other welding helmets. While the multi-adjustable aspect is great, it can be limiting and even detrimental to people who aren’t aware how a helmet should be adjusted. If you’re an overhead welder, this isn’t the best option for you. Often regarded as on of the best welding helmets money can buy, check out why the Hobart 770753 Pro Variable Auto-Dark Helmet is truly a premium product! What makes this helmet different than other battery powered welding helmets? The Hobart 770753 is powered by CR2450 lithium batteries. While most welders prefer solar-powered helmets, the Hobart 770753 doesn’t make it inconvenient to use batteries. Let’s face it: there’s nothing worse than being in the middle of a weld when your welding helmet dies. It’s very rare for welders to have extra batteries. And even if you do happen to have extra batteries, you still have to go through the trouble of finding the batteries and replacing them. That’s why this welding helmet is equipped with battery sensors. Basically, battery sensors will go off when your welding helmet has a low battery. Therefore, you will have enough time to purchase batteries and replace them. So, you don’t have to worry about replacing batteries in the middle of welding. 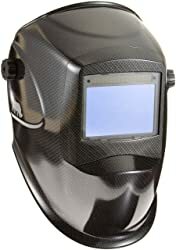 Is this a good welding helmet for maximum eye protection? Yes! Since the Hobart 770753 has auto-darkening lenses, you don’t have to worry about eye protection. Auto-darkening lenses are great because you don’t have to worry about taking your helmet on and off just to view your weld, or to be more comfortable in different environments. Instead, your welding helmet will cater to you and automatically darken or lighten the lenses dependent on your surrounding environment. Although this helmet is battery powered, it is equipped with solar technology. So, your helmet will still have a little bit of life if the batteries die. Optical clarity due to wide lenses. Comes with an easy-to-understand manual. So, even if you get lost using the helmet, you can easily refer to the manual. Up to 3,000 battery hours. Although the helmet is user-friendly, it’s hard to press buttons or adjust anything with gloves. If you tend to sweat a lot while you’re welding, you should wear a sweatband with the Miller Electric Auto Darkening Helmet. Hard to secure tightly and comfortably on your head. The Miller Electric Auto Darkening Welding Helmet is among a number of elite welding helmets that professionals love to rave about. And if it’s good enough for professionals, then it’s good enough for me. How is the Miller Electric Auto Darkening Welding Helmet Multi-Powered? While the primary source of power is from batteries, the Miller Electric Auto Darkening Welding Helmet incorporates solar power into its technology. This is to amplify the battery power, and act as a safety net in case your batteries die during mid-weld. In other words, with the use of solar power, the Miller Electric Auto Darkening Welding Helmet will continue working even if your batteries die. It’s also important to note that even though the Miller Electric Auto Darkening Welding Helmet uses batteries, this is one of the longest lasting battery powered welding helmets. With up to 3,000 hours of potential use per battery set, the Miller Electric Auto Darkening Welding Helmet uses approximately 1,000 more battery hours than the industry standard. Therefore, this is argumentatively one of the best battery powered welding helmets on the market. 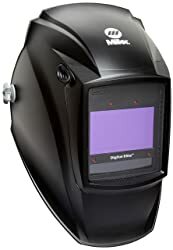 Moreover, the Miller Electric Auto Darkening Welding Helmet is equipped with a ton of advanced technology, the helmet displays these functions in a user-friendly way. So, you won’t have to worry about messing with a bunch of buttons. Comfortable fit for a variety of head sizes. Plus, it’s extremely easy to adjust the helmet to make sure it fits securely on your head. Perfect for welders who like to weld big projects for an extended amount of time. Although the flames add a nice touch, they definitely aren’t subtle. Not as durable as other helmets on the market. Locking function is in an odd location. Make a fashion statement with the Forney 55679 Ice Auto-Darkening Welding Helmet! Aside from being one of the most visually appealing and unique welding helmets on the market, the Forney 55679 offers a ton of attractive features and technology. What makes the design so appealing? Let’s face it: welding helmets are usually so boring. It seems like you can only find welding helmets that are plain black. If you’re lucky, you find a welding helmet that is a solid color other than black. This lack of design makes shopping for welding helmets boring. After all, purchasing a plain black helmet over and over again can get mundane, especially when you’ve been in the business for a while. That’s where the Forney 55679 comes in! 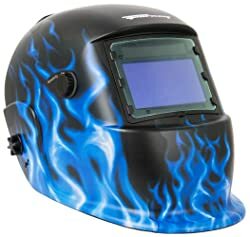 This welding helmet is equipped with a state-of-art design that features light blue flames all over the helmet. So, you can bring a touch of your personality and style to welding! The sensitivity and darkness knobs are argumentatively the best features of the Forney 55679 Welding Helmet! These knobs are external, which means you don’t have to worry about taking off your helmet just to fidget with the knobs. As for the function of these knobs, they make it extremely easy for you to adjust the how sensitive or dark your lenses are. Therefore, the Forney 55679 welding helmet makes it extremely easy for you to examine your work or weld in a variety of environments. With variable shades and wide lenses, this helmet offers some of the widest and clearest visibility on the market. Two modes, so you can have secure and durable protection no matter what kind of project you’re working on. Auto darkening lenses, so you don’t have to experience the hassle of taking off and putting on your helmet a ton of times while you’re welding. Easy to use with a hard hat. Auto darkening feature tends to wear out throughout time. 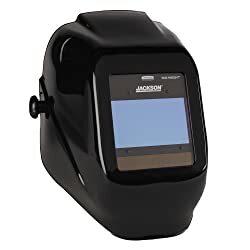 The Jackson Safety 46131 Insight Variable Auto Darkening Welding Helmet is one of the top welding helmets from the renowned brand, let alone the market. Here’s why this welding helmet is so popular! Yes, the weight of a welding helmet is extremely important! Luckily, the Jackson Safety 46131 Insight Variable Auto Darkening Welding Helmet is highly ranked among the lightest welding helmets on the market. At two pounds, it’s hard to find a helmet that’s lighter than this one. Is this welding helmet easy to operate? Yes! One of the best features of the Jackson Safety 46131 is its overall design that is user-friendly, even for new welders. There are minimal buttons and knobs, which are big and accessible enough that you can easily adjust your helmet even when you’re wearing gloves. In the event that you have a little bit of trouble operating this helmet, and you just need a little of guidance, flip through the descriptive manual! The manual is set up in way that it provides a ton of information in an easy to read way. It even comes in three languages! What is the best feature of the Jackson Safety 46131? The best feature of this welding helmet is definitely its level of optical clarity. Between the quality of the lenses, arc, and auto darkening feature, you will experience an optimal viewing area that is extremely clear and precise. The alien design is something new, fun, attractive, and intriguing. You definitely don’t see that on average welding helmets. Auto darkening feature is perfect for fast and efficient welding. But, if you prefer to work without it, you can simply turn it off. External knobs, so you can easily adjust any feature when you’re welding. Maximum sensitivity for optimal security and protection. Abnormal lens size. So, it might be difficult to find a replacement lens. Overall abnormal silhouette that takes a while to adjust to, especially if you’re a seasoned welder. Does not offer scratch resistance, so it’s not the most durable helmet on the market. 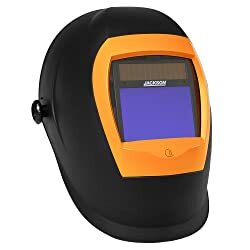 Add a touch of flare to your welding style with the ArcPro 20704 Auto-Darkening Solar Powered Welding Helmet. Since this welding helmet has a futuristic alien design, this is the perfect welding helmets for sci-fi fans, or even welders who have an edgy style. Can I use this welding helmet for any type of welding? Yes! 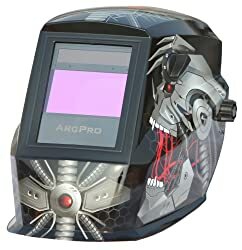 The ArcPro 20704 Auto-Darkening Solar Powered Welding Helmet is equipped with the industry standard welding mode, as well as a special grind mode. So, this helmet will protect you regardless of what type of welding you’re doing, as well as what you’re welding. Are the knobs easy to access? That’s actually one of the best features of the ArcPro 20704 Welding Helmet! There’s nothing more disappointing than finding what you think is the perfect welding helmet for you, only to discover the adjustment knobs are hidden or easy to turn. Luckily, the ArcPro 20704 Welding Helmet has easily accessible knobs that can even be turned easily even if you’re wearing gloves! These knobs include a turn-style mode knob and a simple on and off switch. How comfortable is this welding helmet! It’s safe to say you definitely don’t have to worry about comfort with the ArcPro 20704 Welding Helmet! This welding helmet is equipped with plush padding that makes sure you are comfortable throughout the entire time you weld, even if you weld for an extended amount of time. In addition to the plush padding, this welding helmet has an adjustable headband that’s easy to use. So, you don’t have to worry about fondling with a ton of adjustment pieces just to ensure that your helmet fits perfectly and is secure on your head. Lightweight, so you can easily use this helmet for an extended amount of time. Auto darkening feature, which makes it easy to examine your weld in any environment. External knobs, which makes it easy to adjust anything at any time. Not compatible with hard hats. Unable to use cheater lenses with this helmet because it is not equipped with a retainer. Stay up to date with current trends with the Instapark ADF Series GX990T Solar Powered Auto Darkening Welding Helmet! Between its chic edgy design and its advanced technology, this welding helmet is truly modern. Is this helmet easy to adjust? The Instapark ADF Series GX990T Solar Powered Auto Darkening Welding Helmet is one of the easiest welding helmets to adjust because of its user-friendly design. This welding helmet is equipped with external knobs. So, say goodbye to the days of having to take off your entire welding helmet to adjust one feature, and hello to easily accessible adjustment knobs. Not only are the adjustment knobs featured on the external part of this welding helmet, they are also designed in an easy to grasp way. So, you can easily wear gloves without having to worry about taking them off just to adjust something. How good is this helmet’s visibility? The Instapark ADF Series GX990T Solar Powered Auto Darkening Welding Helmet offers one of the best quality viewing experiences you can find! Like previously stated, this welding helmet is completely modernized. So, it’s equipped with state of the art visibility technology that includes an auto darkening feature, sensitive sensors, and an extremely large viewing area. Is this helmet comfortable to use for a long time? Since the Instapark ADF Series GX990T Solar Powered Auto Darkening Welding Helmet only weighs 1.5 pounds, it is extremely easy to wear for an extended amount of time. Not only is this welding helmet one of the lightest welding helmets on the market, but it offers a plush interior that makes it extremely comfortable to wear. Between its lightweight nature and the plush interior, you’ll barely be able to feel that you’re even wearing a welding helmet! Optimal visibility means you will be able to see a clear, precise, and quality image of your weld without having to strain your eyes. Auto dimming feature isn’t the quickest or most receptive. Features are inconsistent in the sense that the helmet might work great one day, and not so great the next. Since it uses solar power and batteries, you will eventually have to replace the batteries, which could be a hassle or generally inconvenient. With a sleek eco-friendly design, the Tacklife PAH03D Solar Power Auto Darkening Welding Helmet is a true hidden treasure in the welding helmet market. Check out why this helmet is highly rated, even though it’s rarely talked about! What would you rate this helmet’s visibility? 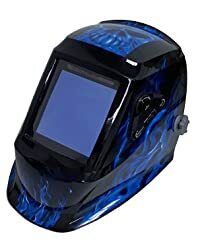 On a scale of one to ten, I would rate the Tacklife PAH03D Solar Power Auto Darkening Welding Helmet’s visibility a ten without second guessing myself. This welding helmet offers one of the best visibility experiences that I’ve ever seen! When you look at the specifics of the Tacklife PAH03D Solar Power Auto Darkening Welding Helmet, it’s easy to see why this welding helmet has fantastic visibility. After all, it has an extremely large viewing area, 3.94” x 2.87” to be exact. It also has sensors on every corner of the lenses, so you don’t have to worry about this helmet’s sensitivity. In addition to the quality and size of the viewing area, the Tacklife PAH03D Solar Power Auto Darkening Welding Helmet is equipped with auto darkening lenses that automatically change with your environment. Overall, it’s safe to say that this welding helmet creates a quality and precise viewing experience. Is this welding helmet durable? Yes! The Tacklife PAH03D Solar Power Auto Darkening Welding Helmet looks extremely durable with its sleek black design, and certainly lives up to its appearance. While most welding helmets are made with Polypropylene, this Tacklife welding helmet is designed with Polyamide nylon. So, it’s resistant to high impacts and corrosion. It’s also flame retardant. In other words, you won’t have to worry about replacing this welding helmet for a long time. 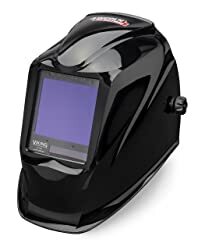 Between it’s futuristic design and advanced technology, the Antra AH60-660-0000 Solar Power Auto Darkening Welding Helmet is another great example of a fantastic modern welding helmet, and here’s why! What kind of applications can I do with this welding helmet? Let’s face it: it’s hard to find a quality welding helmet that offers multiple modes so you can practice an array of welding applications. Luckily, the Antra AH6-660-0000 Solar Power Auto Darkening Welding Helmet is equipped with a standard welding application feature, as well as a grind mode. So, you can practice virtually any welding application for any sized weld with this welding helmet. How is this welding helmet’s sensitivity? The Antra AH6-660-0000 Solar Power Auto Darkening Welding Helmet is extremely sensitive, which is great! Since this welding helmet has maximum sensitivity, it will automatically darken or lighten your lenses depending on how light your environment is. The sensitivity sensors will also tailor your overall viewing experience depending on your environment. So, you won’t have to worry about playing with your adjustment knobs for a ton of time before you start welding or even in the middle of a weld. Compatible with cheater lenses, so you have the option of having a truly magnified viewing experience. External knobs make it extremely easy to adjust any feature of this welding helmet at any time. So, you don’t have to worry about taking off your helmet during a middle of a weld just to adjust a minor feature. Lightweight, so you can wear this welding helmet for an extended amount of time without having to worry about neck strain or head pain. Multiple modes to cater to virtually any kind of welding application. Manual is extremely descriptive and overall user-friendly. So, if you have any trouble using the helmet, you can easily refer to the manual for a little bit of guidance. Although this welding helmet is compatible with hard hats, you have to purchase an adapter for an additional price. The adjustments are flimsy if you adjust them too much. In other words, the adjustments easily fall off if you keep them loose. Although the visibility is clear and precise, it doesn’t work perfect all of the time. If you use this helmet a lot for an extended amount of time, the visibility declines. While industrial welding helmets have a ton of benefits for people weld just for fun, they tend to be a tad expensive and difficult to use. But, it’s hard to find a simpler welding helmet that has the perfect balance of industrial and hobbyist welding helmet benefits. That’s where the RHINO LARGE VIEW + GRIND Auto Darkening Welding Helmet comes in! Does the viewing area match its acclaim? Absolutely! While some welding helmets don’t live up to what they market, the RHINO LARGE VIEW + GRIND Auto Darkening Welding Helmet doesn’t let anyone down. This welding helmet is equipped with a viewing area of 4” x 2.6”. In other words, this is easily one of the largest viewing areas that money can buy. Is this welding helmet safe? Since the RHINO LARGE VIEW + GRIND Auto Darkening Welding Helmet features a shell made out of nylon, it is one of the safest welding helmets on the market. Nylon is an extremely durable material that is resistant to various things, such as ultraviolet. Therefore, the RHINO LARGE VIEW + GRIND Auto Darkening Welding Helmet’s advanced outer shell will provide maximum protection to your eyes from rays and lights, and even your head from potential accidents. Between the lightweight nature of the nylon material that composes the outer shell and an overall flexible simple design, this welding helmet is extremely lightweight. So, it’s easy to comfortably wear this welding helmet for an extended amount of time. External knobs make it extremely easy to adjust every aspect of this welding helmet at any time. With an array of modes, you can practice different types of welding. User-friendly design, which makes it for anyone to use regardless of their welding experience. Sensitivity is not super receptive. Adjustment knobs are flimsy. So, be prepared to tighten them regularly. Due to the composite of materials, you cannot practice certain types of welding, such as overhead laser cutting. What to Look For in a Welding Helmet? Since welding helmets come in an array of designs and silhouettes with different features and technology, deciding which welding helmet is right for you is ultimately a personal decision. But, hopefully this guide will made it easier for you to decide what features you want in a welding helmet, and possibly even which welding helmet is right for you! People are often surprised to discover there are a lot of elements to welding helmets. Welding helmets come in a variety of sizes with different features that cater to an array of welders. That’s why it’s important to understand the basics of choosing a welding helmet! Whether you’re a new or expert welder, it never hurts to know a few tips for buying a welding helmet. The type of lenses your welding helmet has will ultimately determine your visibility. Modern LCD technology that senses when the torch is on and off. The ability to keep your helmet on to examine your progress. The ability to automatically change from dark to light visibility. Different coats, such as UV and infrared. So, expect to take off your helmet whenever you want to check out your weld. At least a minimal amount of distortion. The shade of a welding helmet controls the amount of light the helmet filters. There are two kinds of shades, which cater to different people’s eyesight and welding techniques. The first kind of shade is variable. Variable shades feature adjustable lenses, so you have the option of positioning the lens so it covers your eyes, or placing it outside when you’re taking a break, or simply don’t need it. Usually featured in higher-end helmets, so get ready to spend some more money. Since variable shades already include auto darkening, you won’t have to worry about taking off your helmet just to examine your progress. The other kind of shade is fixed. Fixed shades require you to use the torch first. Once it is in the proper position, you are able to use your helmet. Usually featured in standard helmets, so fixed shades are not as expensive as variable shades. Requires you to take off your helmet when you want to examine your progress. Modern technology has enabled welding helmets to offer different kinds of power, such as solar and battery. Another big difference among many popular welding helmets is the kind of knobs the helmet has. External knobs are one of the commonly used knobs. Since they’re self-explanatory, they are featured on the external portion of welding helmets. Internal knobs are the other kind of commonly used knobs. Featured in the internal portion of welding helmets. In order to adjust them, you must take off your helmet. The two main viewing sizes are 6 sq. and 9 sq. A welding helmet with 6 sq. is perfect for welders who only weld as a hobby, or only do lighter projects. On the other hand, welding helmets with 9 sq. are perfect for professional welders who practice industrial welding. Welding helmets also vary in weight. It’s important to consider how much weight you can handle. Bulkier welding helmets could put a ton of strain on your head and neck, which could cause discomfort and fatigue. So, make sure your welding helmet isn’t too heavy. When you’re in the process of buying a new welding helmet, it’s extremely important to make a budget. While there are many industries where price doesn’t have a correlation to quality, welding is not one of them. In fact, there’s a direct correlation between how a welding helmet costs and its features and designs. On one hand, if you don’t spend enough money on a welding helmet, you might end up with a welding helmet that’s poorly constructed and even potentially dangerous to use. But at the same time, you shouldn’t purchase an extremely expensive welding helmet if you’re new to welding because it will most likely be too much of an investment that ends up being too difficult to use when you’re starting out. Overall, just be wary of the price. If the price seems too good to be true, it’s probably not a quality welding helmet. But if you’re a new welder, refrain from purchasing a super expensive and advanced welding helmet. There are literally thousands of welding helmets on the market. It would take you days, maybe even weeks or months to examine all of the available welding helmets. So, make your search easier and determine what you want. Are you a new welder that wants a cheap and simple welding helmet or are you an expert welder who is willing to spend hundreds of dollars for the most advanced and intricately designed welding helmet? Maybe you want a classic black welding helmet you can use any day, or you want a specially designed welding helmet to keep more as a novelty. Regardless of your needs and design preferences, it’s important to determine what you want in a welding helmet before you start shopping because it will help you filter out all of the helmets that are unsuitable for you. While welding helmets are available in store, it’s smarter to buy one online. After all, the internet gives you access to every acclaimed welding helmet. Also, welding helmets tend to be cheaper online. The best part of shopping online is the ability to open a new tab and search for reviews once you find a welding helmet you might purchase. Reading reviews gives you an honest insight into what owning and using the product is really like. That’s something you definitely won’t have access to if you shop in store. There are thousands of welding helmets on the market. When purchasing a welding helmet online, it’s extremely important to consider the fact that prices have a direct correlation with quality. So, you might not want to purchase a super cheap or expensive helmet. Instead, you should opt for a happy medium. Let’s face it: there are a ton of welding helmet brands. In fact, there are so many brands it can be difficult to determine which brands you should trust, and which brands you should dust off your shoulder. That being said, here is a short list of the best welding helmet brands and why they are critically acclaimed! Argumentatively the most popular welding helmet brand. Also referred to as Lincoln Electric. The Viking line has been critically acclaimed as one of the best styles of welding helmets money can buy. Most of their helmets use solar power, so you don’t have to worry about the hassle of using batteries. Promotes optimal comfortability through air purification and plush interior padding. Stays up to date with modern trends through a variety of designs and finishes. Provides an optimal viewing experience. Ranked as one of the safest and easiest to use welding helmet brands to use. One of the oldest welding helmet brands that consistently stays up to date with current trends and innovative technology. One of the only welding helmet brands that appeals to men just as much as it appeals to women. All Jackson Safety helmets are equipped with an auto darkening feature, so you don’t have to worry about taking off your helmet just to examine your work. Provides an optimal viewing experience through wide angles and clear lenses. Offered in a variety of colors and designs that go above and beyond standard solid grey or black. Often regarded as the safest and most durable brand on the market. Critically acclaimed by ANI, CSA, & CE standards. Offers four different series with different styles, features, and prices. Each helmet completely protects face, head, and neck. Innovative shell technology for maximum safety and durability. Incorporates a blend of solar and battery power. Offers some of the best wide viewing available. Equipped with some of the darkest lenses on the market, such as the 3M Speedglas Welding Helmet 9100V, which has a level 13 lens. Argumentatively the most exclusive and luxurious welding helmet brand on the market. One of the best metal hood designs available. Offers a range of welding helmets suitable for new welders and expert professional welders. Surpasses industry standards for performance and exclusive innovative features. Provides consistent, fashionable, and modern shells that are also extremely safe and durable for long term use. Ensures every helmet is equipped with an auto darkening feature, so your welding experience is efficient and easy, and you don’t have to worry about adding extra protection for your eyes. With five different series, Miller Electric offers something for everyone’s welding experience, needs, and budget. Perfect company for new welders who want a quality but easy to use welding helmet. All of their welding helmets are extremely user-friendly. Integrate traditional and modern features, design, and technology. #1 What are the benefits of using an auto darkening welding helmet? Let’s face it: welding isn’t necessarily the safest thing you can do. After all, welding requires the use of extreme light and heat. And if your eyes or skin come into direct contact with that level of light and heat, you could potentially suffer from critical conditions. So, a welding helmet protects your head and neck from a variety of potentially harmful things, such as ultraviolet and infrared light, and extreme heat. #2 What welding helmet is the best for long-term health? This is a very personal question. Ultimately, it’s up to you to determine what type of welding helmet you need for your health. But, generally you should aim to purchase a welding helmet with a lens grade of eight to ten. Also, be prepared to use your welding helmet with an oversized hard hat and to replace the clears frequently. #3 Are auto-darkening welding helmets safe? Yes! If anything, they’re safer than welding helmets that don’t have an auto-darkening feature because they automatically adjust the quality and darkness of your lenses depending on your environment. So, you won’t have to worry about messing with your helmet in between welds because of a change in your environment or needs. #4 How do I customize a welding helmet? There are a few ways you can customize a welding helmet! If you want to add more protection and a little bit of style, add a hood or a mask to your welding helmet. If you’re feeling super crafty, paint your welding helmet! #5 How does auto darkening welding helmet work? Auto-darkening glasses primarily use solar technology to determine when to get lighter and darker. Basically, the auto-darkening glass is surrounded by an arc equipped with sensors that detect changes in your environment, specifically in terms of light. So, when the arc detects a change of light, it signals the sensors, which adequately adjust the auto-darkening glass. #6 What’s the difference in welding helmet filters? Welding helmet filters are ultimately dependent upon light. So, there are lighter and darker welding helmet filters that carry to a variety of light environments. #7 What is grind mode on a welding helmet? Grind mode is usually mode for grinding, which is the process of cutting and smoothing material. Grinding mode is useful, especially in auto darkening helmets, because it will prevent your lenses from getting too dark. #8 How do I hand paint a welding helmet? Prior to painting, take the lenses out. Use a wire brush to prep your helmet.This will help make the paint smoothly adhere. Use fire resistant primer and paint. #9 Can I use a welding helmet to view an eclipse? You can only use a welding helmet to view an eclipse if it has a level 12 or higher shade. #10 Where can I buy an auto darkening welding helmet? You can purchase a welding helmet from a variety of places, such as specialty stores and general home improvement stores. Purchasing welding helmets in person is a great option for new welders because you have the opportunity to talk to professional welders first hand. Also, you will have the opportunity to try on welding helmets before committing to one. The internet is also a great place to buy a welding helmet. Simply search the phrase “welding helmets” and you will automatically come across thousands of websites that sell welding helmets. If you want to browse through an array of welding helmets, check out Amazon!